Sometimes you just need a really good salad. But back to the serious business of salads. Sometimes you just really need a salad. Like, say if you're about to get blood taken, you want to fit into that cute dress later, or you've been doing upside acrobats down like a monkey all morning. After one such morning at Aerial Yoga Houston, my friend Lindsey and I needed some nourishing food in a major way. We decided to hit up Dry Creek Cafe, a restaurant in Houston's Heights neighborhood. I've been to Canyon Creek, Onion Creek, Cedar Creek, and Lowbrow, but never to Dry Creek. I sincerely love all of their other bars/restaurants and excellent food, so I was excited to try this one! We started off by splitting the crispy brussels, which are served with a creamy serrano sauce. 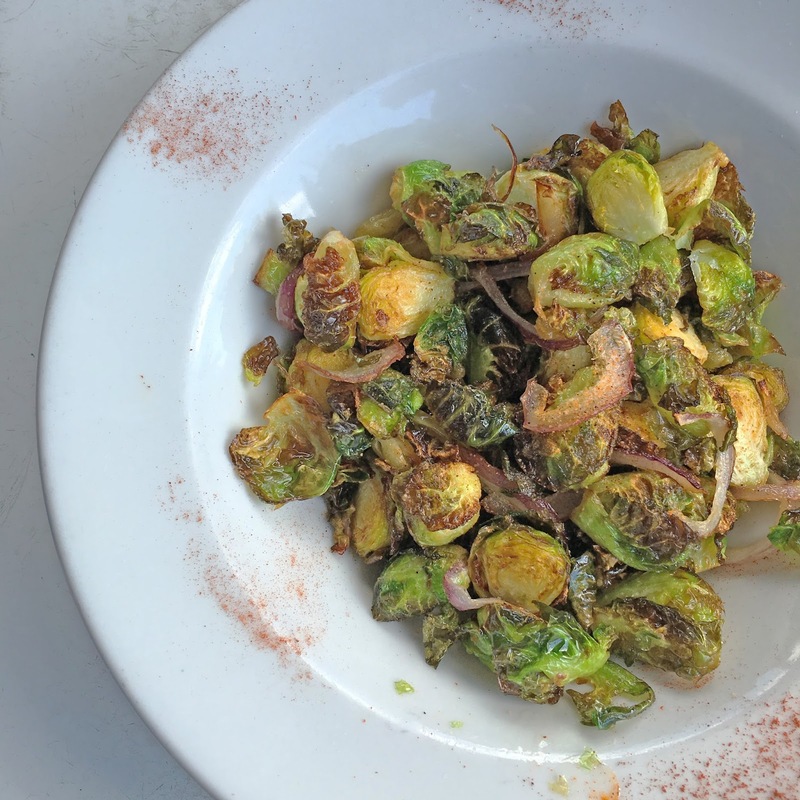 The perfectly toasted brussels sprouts were tossed with golden raisins and red onions, which gave them a wonderful sweet/sharp contrast of flavors. While the creamy serrano sauce added a soft, light tang to the sprouts, they were awesome enough on their own to do without! As previously alluded to, for my main round of food I ordered the goat cheese salad. 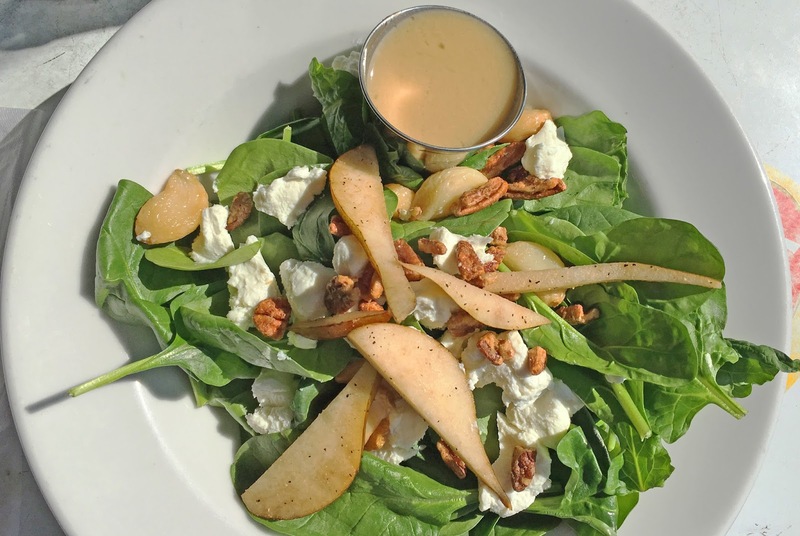 Roasted garlic, creamy goat cheese, sweet pear, and candied pecans were served atop a bed of spinach. I opted to enjoy my salad with the recommended side of honey mustard dressing. This light, playful salad was just what I needed. The creamy, mild goat cheese muted some of the sweetness from the other elements of the salad, and the candied pecans offered a wonderful dose of texture and naughtiness. And how can you not completely adore something that contains pieces of whole roasted garlic in it?? This was the perfect post-aerial-yoga-madness meal! Much like the other Creek Group restaurants, Dry Creek Cafe did not disappoint. 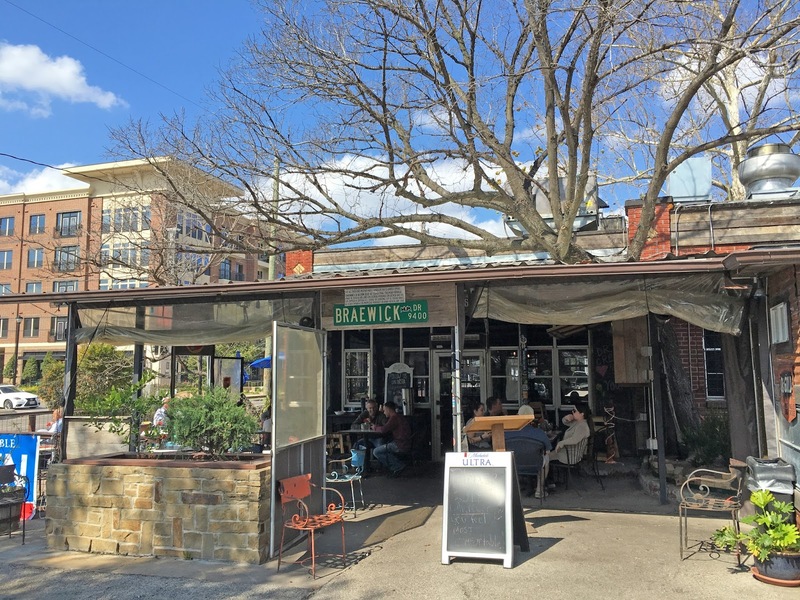 The relaxed patio is a great spot to enjoy one of these beautiful Houston spring days. The food is simple - yet thoughtful, well-prepared, fresh, and delicious. I'm happy to now have it on my ever-growing list of Houston lunch spots! The Tipsy Dessert Bar + A Giveaway!